Oh, how I loved it! A huge, steaming bowl of indiscriminately chopped roasted chicken, noodles, and other goodies. The perfect antidote to an overly indulgent night of bar-hopping and the most excellent precursor to a weekend matinee with my girlfriends at the time. Pho satisfies a similar need. We have some great Pho places near us where we live now. 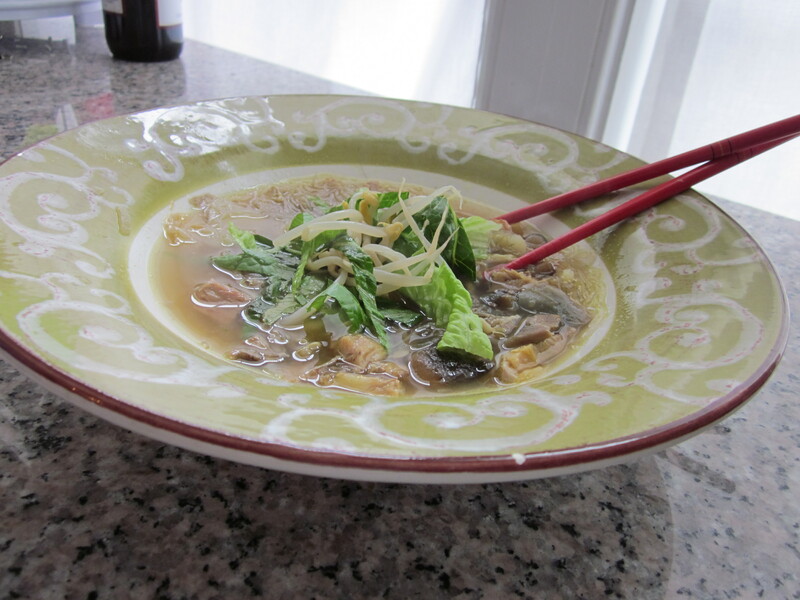 I love getting that pile of ingredients and hot broth and just digging into a steaming Pho Ga. The problem with not living in New York anymore is that other cities DO sleep, and that means the Pho isn’t instantly available at all times. The nerve. As a result, Dan and I have periodically thrown together our own noodle soup for those Sunday mornings when nothing else will do. And you know what? It’s good! I don’t claim that it’s the healthiest meal I’ve ever made (although there are much worse things you could eat). I don’t claim it’s authentic in any way. I don’t even claim that it isn’t made with a bunch of stuff out of a can. But when you really want a noodle soup and the Pho place is closed and you can’t drive into New York City…well, here’s your answer. Meat…if you want. Any leftover chicken, pork, or steak can work, as long as it was cooked simply (I’d avoid BBQ, fyi!) You could even poach or roast some chicken on the spot if you have lots of energy. I suppose, if you’re feeling really reckless, you could just stir fry the raw meat right in the pot. Grease? What me worry? Never tried it yet, but go for it. Cabbage – any kind will do, but I like Napa or Bok Choy. You’ll note at the end of my post that I even garnished my soup with shredded romaine. You really only need a few of these things. 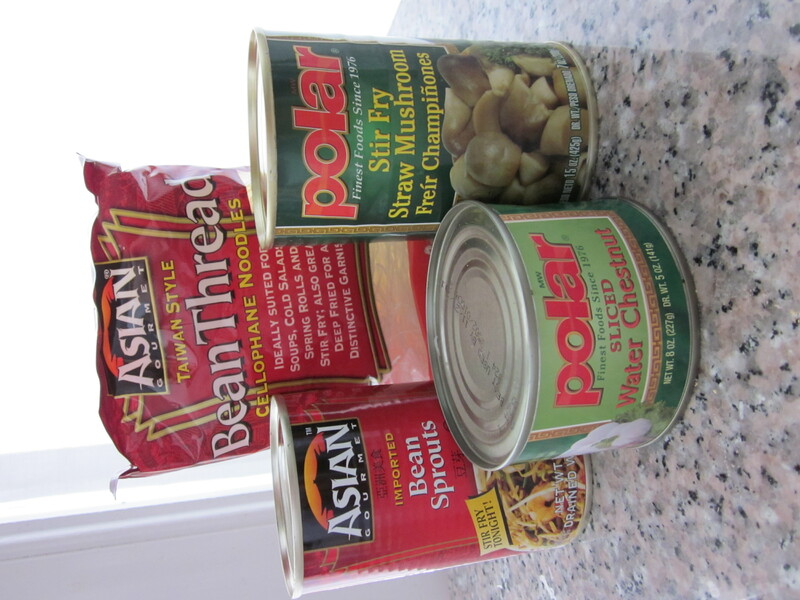 If you have boullion (or some existing stock) and just the noodles and one or two other items, you are good to go. And, of course, you can always substitute fresh ingredients when you have time to get them. Shady characters from the pantry. Shhh! You heat some vegetable oil (not a lot) in a heavy-bottomed pot. Throw in your onions and cook them patiently so that they don’t burn. The exception would be if you’re using delicate scallions, which really could be just thrown in the broth later or even used as a garnish. 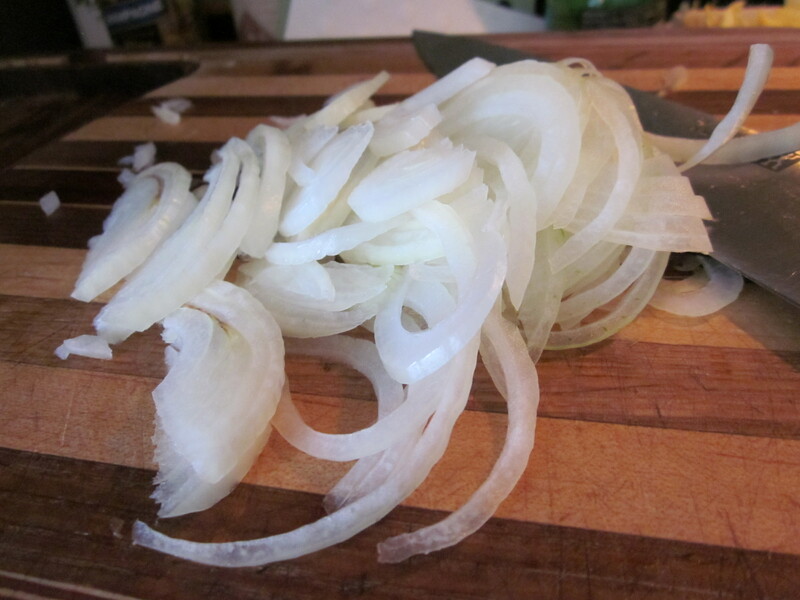 Assuming you’re using regular onions or shallots, though, saute them. If you need to add more oil, do. Alternatively, you could add some broth to keep the fat down. I do like that sauteed flavor, though! Another option is to use a little fat from the pork or steak instead of vegetable oil. That adds a little extra flavor and you can fish out that fat before adding everything else. If you are using shredded cabbage, add that and saute it until it gets soft. When the onions are translucent and the cabbage is ready, toss in your meat (cooked) and just give it a little time to get nice and toasty. Don’t dry it out, though! If it starts to look dry, put some broth in to keep it juicy. At this point, you can throw in your mushrooms, water chestnuts, and bean sprouts and cover with as much broth as you like. 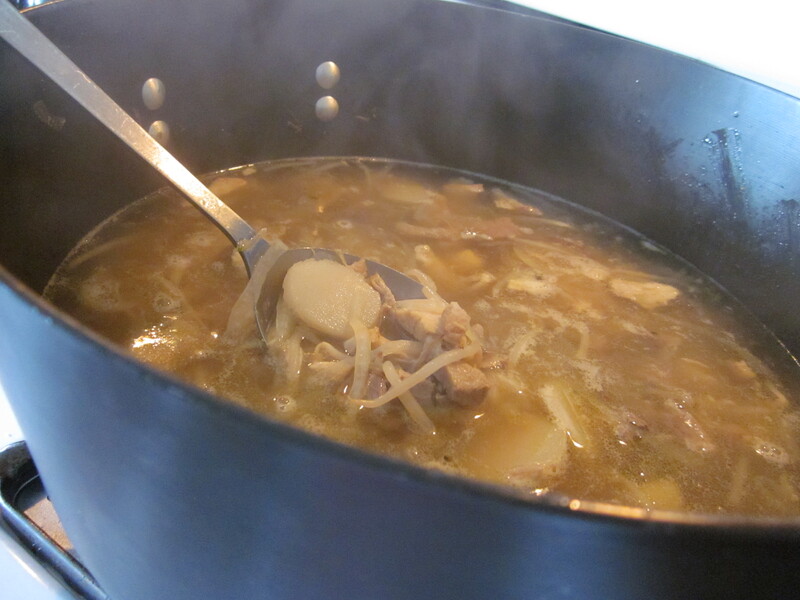 Again, you can either create the broth from boullion or you can use stock. I like to use hot broth (so you could heat it in another pot first) to keep all the ingredients from cooling down and heating back up. Honestly, though, the world will not collapse around you if you are too lazy. Bring the broth back to a simmer. Eyeball it and make sure that there’s plenty of broth so that when you add the noodles, you don’t get STEW. Now is a good time to taste your broth. Do you need another boullion cube or two? If it tastes almost flavorful enough, hold back. The soy sauce is very salty! You’ll be adding that last. Depending on the type of noodle, you may need to cook it in the soup for several minutes or hardly at all. Read the package. Cellophane noodles are cooked practically as soon as they get wet. The very last thing you would add, if you’re using it, is extra firm, cubed tofu. You don’t want it to break up and dissolve! Once the noodles are cooked and tofu is warm, add a splash of soy sauce to the soup. Taste and adjust as needed. If you screw up and overdo the soy sauce, don’t freak. Just add more broth or water to balance it out. That’s it, folks. Please don’t report me to the Society for the Assurance of Authenticity in Asian Cuisine. I’m sure there is one. I’m sure they won’t like me. Serve up your noodly goodness in a nice, big bowl and get ready to slurp. When you have satisfied those hangover munchies, take whatever is left and store it in the fridge. You can easily add more broth or noodles later for another meal. That is another fabulous thing about Faux Pho. It’s the fix that keeps on fixing. Or fauxing. Anyway, you can eat more later. Even our little guy likes it, although he was a bit flummoxed by the cellophane noodles. What are these clear thread things? In conclusion, I am probably about to eat my entire RDA of sodium in one bowl, but it’ll be awesome. I hereby dedicate this post to my dear friend Kim, who shared many bowls of noodle soup with me in Manhattan. Now that she lives in Yonkers with a husband and two kids, and I live very far away, she sometimes drives us 45 minutes into the Bronx when we visit, just so we can get some noodle soup. Well, Kimmy, in the meantime, here’s your dirty cheater recipe. Enjoy! You are killing me!! I’ve never even had Faux Pho, but I’m willing to suffer a hangover just to try this! You make it seem so easy…and if it’s soup..I’m always in! 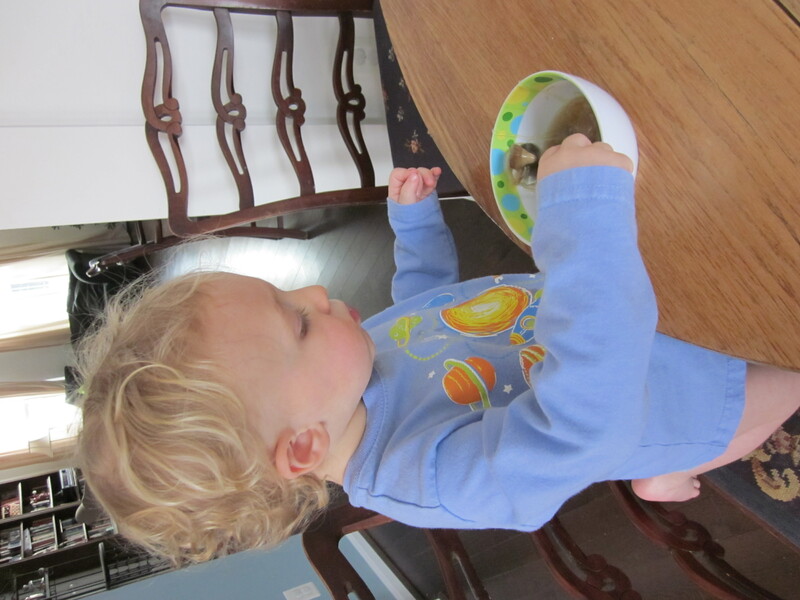 BTW…the pics of your little one eating all of your recipes are sooo cute! !